Impreza 1.5.4 newest version : Released on June 10th, 2014. Impreza is modern professional and flexible fully responsive retina-ready WordPress theme, developed with great attention to details. Theme can be used for any type of website: business, corporate, portfolio, products, marketing, online store etc. 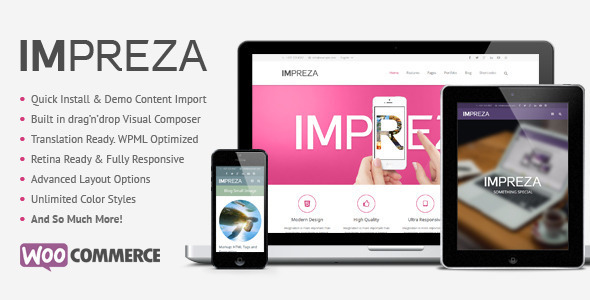 Impreza provides responsive and flexible design. All page layouts works perfectly on all devices, from large monitors to mobile phones. All elements enhanced for Retina displays, so they look clean and sharp on modern gadgets. The theme gives you opportunity to change layout settings for whole site and for each particular page.